What is the name of this character from Rugrats? What is the name of this character from Doug? What is the name of this character from Hey Arnold! ? What is the name of this character from Dexter's Laboratory? What is the name of this character from The Powerpuff Girls? What is the name of this character from Arthur? What is the name of this character from Rocket Power? 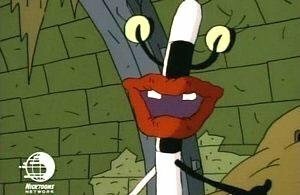 What is the name of this character from Aaahh!!! Real Monsters? What is the name of this character from Recess? What are the names of these two characters from KaBlam! ?